Hi, my names Amy and I'm a Lush addict! On the 22nd August, I was invited to attend a Lush event in Southampton and as a Lush addict how could I possily turn it down. This is the second Lush event I had been invited too in the last two months, so I'm feeling super lucky to get these opportunities. Especially as all Lush staff members are so lovely.You can check out the Lush summer skin care post here. So on Friday, I travelled to Southampton and met up with the lovely Alice (@alicespake) and Karis (beautybykaris) for a drink first, then we headed on down to the Lush event. Upon entering we were greeted by Rosie, the manager. She was very welcoming and directed us to a table with yummy snacks on. My favourite was the Rice Up vegan cupcakes (@RiceUpLTD), such delicious goodness! Lush also spoiled us for drinks choices, including champagne so I of course opted for that one. We then mingled around and I got to catch up with other lovely bloggers I've met before and meet some new ones. It's always a good feeling to meet bloggers, especially as I never realise how many bloggers there actually are in the South. After talking to the lovely girlies, we then paired up with another blogger to play an ice breaking game. We were given massage bars and gave each other arm massages while finding out about their blog and if they were new to Lush. We then introduced our partners name and information to the rest of the girlies around the room. After this we were then divided into two groups, one group watched how Lush make their best selling face masks 'Cupcake' and 'Catastrophe Cosmetic' and the other group got a go on their 'Emotional Brilliance' wheel. You can play have a go at the 'Emotional Brilliance' wheel on the Lush website. Once we had done this, we got to mingle, eat and shop for the rest of the evening. I can't resist smelling everything in Lush, why does it all have to smell so delicious! We were also very spoilt and got given a goodie bag each full of full sized products. We were also given a surprise goodie bag to give away to our lovely readers, so keep an eye out on my Twitter (@amzyinwonderlan) for that soon. 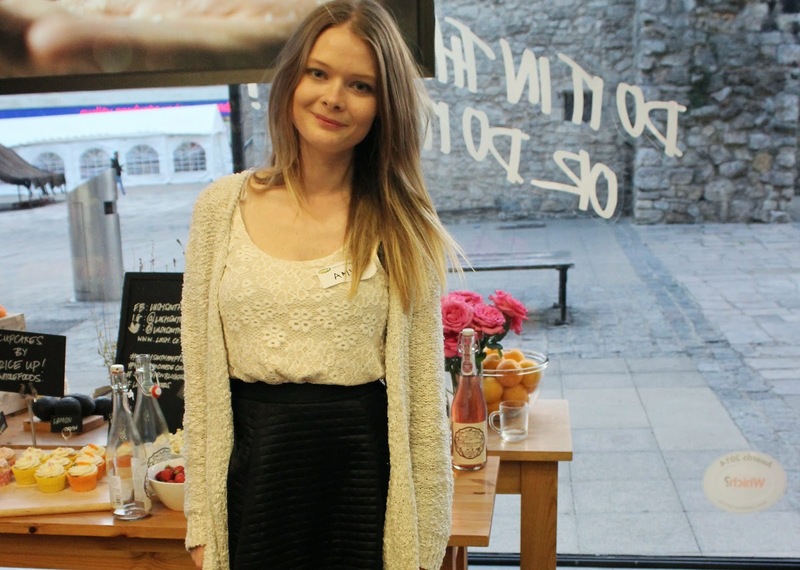 I would like to say a huge huge thank you to all at Lush Southampton for hosting a fun filled evening! All the staff members were so lovely and hellpful with all of our queries. We also got the Cupcake face mask to keep but mine is in the fridge as it's leaking. They all look delicious! You have made me really want to try one of their face masks now... I know where I'm heading tomorrow morning! The pictures are gorgeous and I love lush! This event looks fabulous and the window display in particular looks so beautiful! The face masks looks so good, although this post has reminded me that it's been a couple of years since I last treated my skin to one! !